Do you remember back in the early ’80s when a young Swedish guitarist shook the world afresh with his flashy yet technically very accurate and fast neo-classical stylings with mixolydian and phrygian scales and runs? His playing spawned a plethora of guitarists who picked up a guitar and tried to emulate his approach and sound, often with differing degrees of success and impact. You can name loads of them from Jason Becker and Tony MacAlpine through George Lynch, Vinnie Moore, Randy Coven and countless others, many of whom ended up in those Hair Metal bands of the mid to late ’80s. Well love him or loathe him, Yngwie Malmsteen was definitely a genuinely new talent, and despite his career having its peaks and troughs he still inspires many guitarists today. So let me introduce you to a new guitar player who is heavily influenced by Mr. Malmsteen, and whilst not being a clone he certainly shares Yngwie’s passion for the guitar. 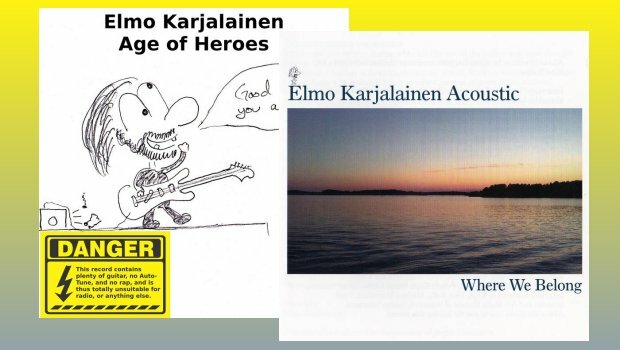 Elmo Karjalainen hails from Turku on the west coast of Finland, quite near to Helsinki. Elmo is a fine guitarist who, as I say, holds Yngwie in very high esteem and can shred with the best of them, yet behind all the Norse God stylings is a musician who has a deep and abiding love of music, crafting his own with considerable skill and talent. With Elmo you get a lot of shred for sure, but you also get melody and harmony and something more than a solo. You get a song that you can appreciate rather than just listening out for the lightning fast scales and soloing. The Age of Heroes album is primarily an electric rock shred-fest, although it has some great guest appearances from the likes of Derek Sherinian (ex-Dream Theater and Black Country Communion) on keyboards for the track The Colour of Greed, and two of his fellow Guitar Gods, Janne Nieminen and Emil Pohjalainen, on the aptly but humbly titled The Meeting of Gods (And This Guy). If you appreciate players like Yngwie, Joe Satriani or Steve Vai, you will love Elmo as his music is in a similar vein and is very worthy in its own right. Elmo also loves Genesis, and the track Sunset is very much influenced by Steve Hackett. Age of Heroes is a fine CD and well worth hearing – you can download it from his website. However, as much as shredding is fun and fine, Elmo has also released a fantastic acoustic CD, Where we Belong, that is a different proposition, really relaxed and a fine album for winding down to. These 15 gentler songs have much to commend them with no loud electric guitar but with lots of atmosphere and gentle soothing melodies. Fans of Steve Hackett’s acoustic albums will find this especially of interest as there is much fine music to be heard on here, all composed and performed by Elmo himself, apart from the drums on Laiturilla. I really like Where We Belong a lot, possibly more than Age of Heroes, but I fully appreciate that the electric style of playing is Elmo’s preferred gig, yet I also like that he is not afraid to try a different style and he has done a spectacular job with both. I highly recommend both of these albums to all.